A total eclipse of the Moon will occur on Saturday (April 4, 2015) from 15-45 hours to 19-15 hours Indian Standard Time (IST). The Eclipse will be visible in the region covering eastern Asia, Australia, North America, western half of South America, Antarctica, the Indian Ocean and the Pacific Ocean. The places from where the beginning of the umbral phase is visible at the time of moonset are Argentina, western part of Brazil, eastern part of the USA and Canada. The places from where the ending of umbral phase is visible at the time of moonrise are some parts of Pakistan , Kazakhstan, India and some parts of Russia. The totality of this eclipse will last for a very short duration. In India the initial umbral phase of the eclipse will not be seen. At the time of moonrise, the totality phases of the eclipse will be visible from the extreme north eastern region of India and Andaman and Nicober Islands. Rest part of the country will only see the partial eclipse. 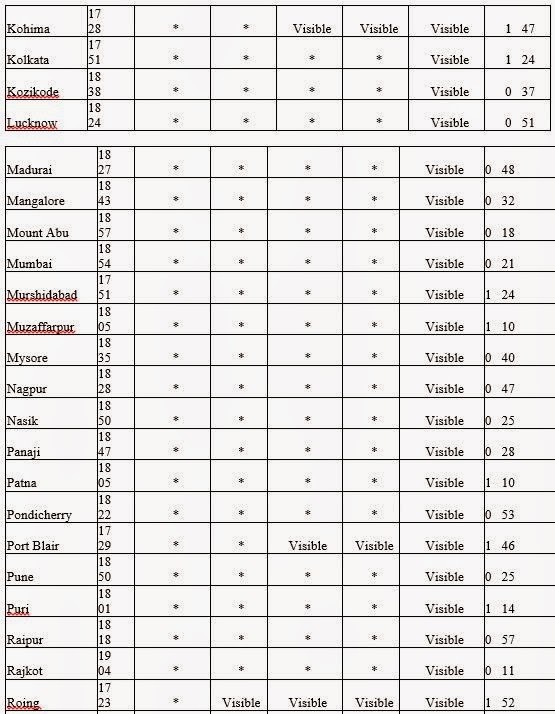 A few places from where the totality phase will be seen at the time of moonrise are Aijawal, Dibrugarh, Imphal, Itanagar, Kohima, Tezu, Port Blair etc. Duration of the eclipse : 3 h 30 m.
Duration of totality :0 h 12 m.